There’s a lot of talk about Opportunity Zones lately. But, what are they? The Tax Cuts and Jobs Act (TCJA) of 2017, passed under President Trump, created the Opportunity Zones program to spur investment in economically depressed areas. An Opportunity Zone is a geographic area designated by the state and certified by the Secretary of the U.S. Treasury. Opportunity Zones provide preferential capital gains treatment for investments in the hopes it will increase investment. They either delay or reduce the capital gains tax liability. More than 8,700 areas in the U.S. were designated Opportunity Zones by the US Treasury. Short-term capital gains (profits on assets sold within one year of purchase) are taxed at a taxpayer’s ordinary income tax rate. Long-term capital gains (profits from assets held longer than a year) are taxed at either 0 percent, 15 percent, or 20 percent, based on a taxpayer’s income. Investors have 180 days to invest these capital gains to qualify for the Opportunity Zone tax breaks. 10 years. Additional capital gains forgiven. However, capital gains cannot be invested directly into a property. They must be invested in a Qualified Opportunity Zone Fund. A qualified opportunity fund as any investment vehicle organized as a partnership or corporation that holds 90 percent or more of its assets in qualified opportunity zone property. A Qualified Opportunity Zone Fund is any investment vehicle which is organized as a corporation or a partnership for the purpose of investing in qualified opportunity zone property. The fund must hold at least 90 percent of its assets in qualified opportunity zone property. Continued investment in the fund to improve the property is expected. The fund requires improvements equal to the Opportunity Zone Fund’s initial investment into the existing property over a 30-month period. For example, if an Opportunity Zone Fund acquires existing real property in an Opportunity Zone for $1 million, it has 30 months to invest an additional $1 million for improvements to that property in order to qualify for the program. Opportunity Zone improvements do not include golf courses, country clubs, massage parlors, hot tub facilities, suntan facilities, race tracks or other facilities used for gambling, or liquor stores. In case you were wondering. Atlanta was the third-fastest growing city in the country in 2017. The 285-acre Bellwood Quarry, near the Bankhead MARTA station, is adjacent to an Opportunity Zone. Zoning allows for up to 850 new residential units, a 300-room hotel and nearly 600,000 of office and retail space. The Interlock development in West Midtown will include boutique hotels, 500,000 feet of office space, 100,000 square feet of retail space, 350 apartments and 70 single-family homes and is adjacent to an Opportunity Zone. GSU’s Summerhill project is located in an opportunity zone that will impact the Summerhill and Grant Park neighborhoods. These large scale real estate developments and neighboring Opportunity Zones will feed each other’s growth. They offer opportunities to enjoy spillover benefits of the developments planned or underway over the next decade. Because the tax bill was passed in a hurry under President Trump, the IRS and Treasury are still working on the specifics of how this fund will work over time. There is a ton of planning and exploratory work being done by investors in anticipation of upcoming investments. As always, you should talk to a qualified financial advisor before making any investments of your own. 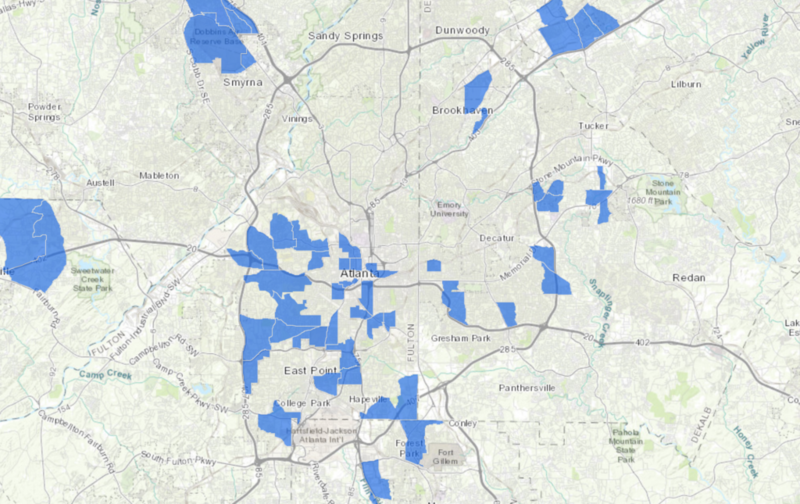 For more information about Opportunity zones in Atlanta, contact Invest Atlanta.